(Phys.org) —Japan's portfolio of robot creations has become well known as a versatile one that includes personal home robots which, in appearance as well as functions, can motivate humans to like spending time with them. The robots are not human-like in appearance. Their designers, as if to deliberately ward off the discomfort that comes with uncanny valley qualms that one's machine friend is too lifelike, focus on robots that are somewhere between cute little pets and cute toddler-like cartoon characters, or harmless space creatures for preschoolers. As a result, their creators seek to have people of all ages, including the aged, feel comfortable staying side by side with the robots, communicating with them and allowing the robots to help them with daily tasks. An especially engaging example has been NEC's PaPeRo (short for Partner-type-Personal-Robot). This robot has a long history, long at least in computer years, going back to 1997, when NEC began development for the R100. The name PaPeRo was adopted in 2001, with the robot drawing attention not only for its cute appearance but facial recognition system. NEC has over the years produced different PaPeRo variants. This month, NEC announced its latest PaPePro rendition, the even smaller "PaPeRo petit" robot, which could serve a household in a number of ways, as a nanny, or as a sentinel housesitter, among other roles. The PaPeRo petit is about 9 inches tall—half the size of the previous version—and weighs less than three pounds. NEC is now looking outside the company, for partnerships where the robot's services can be expanded and where new software applications could help hasten the robot's entry potentially into people's homes, schools. and offices. The robot now has a number of sensors and several cameras. Earlier this week, NEC announced the "PaPeRo Partner Program" for providing services using a robot and cloud computing system. 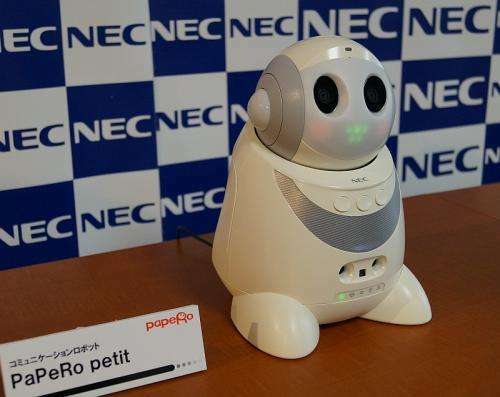 For the PaPeRo Partner Program, NEC developed not only the smaller-sized "petit" version of the PaPeRo R500 communication robot but also a cloud computing system for services using the new robot. According to a Tuesday report from House of Japan, the company will offer an application programming interface for using the PaPeRo petit and cloud computing system to its partner companies. According to Kyodo News, NEC said it will offer a new service as early as January 2014 "that will allow family members living apart to watch over each other utilizing the robot and cloud computing technology." According to The Japan Times, NEC Associate Senior Vice President Takemi Hosaka said NEC will launch the service in Japan first, but eventually wants to expand overseas, including Australia.